Seventy-seven percent from the field in a half and 63 percent overall? For 20 minutes of basketball, it takes much more than luck to accomplish that. All season, Bradley fans have been wondering where this offensive talent has been. Ever since Jim Les took the reigns of this program, it was supposed to run like a well-oiled machine. And under him, it has. The guard play over the years has been outstanding, especially shooting the ball and when they’ve been able to find decent big men, they’ve had success. I know this year didn’t get off the ground, due to injuries, but the Braves are still a talented team. Senior Andrew Warren displayed with regularity that he was capable of shooting from anywhere on the floor. 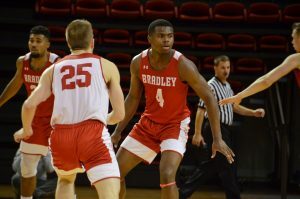 His offensive numbers were unrivaled by anyone in the Missouri Valley Conference and had Bradley been a top-half team in the conference, he would have easily walked away with the Larry Bird Award. In addition to Warren, the leadership from senior Dodie Dunson was there and the rapid progression of sophomore All-MVC Most Improved teamer Dyricus Simms-Edwards from a physical guard who can drive to an all-around point guard should have been enough to compete. But luck never really fell on Bradley’s side. Tough loss after tough loss early in the season and in Valley play took its toll. After blowing early leads in what seems like every game, it becomes hard to play, let alone watch. That said, there’s no excuse for this season. With injuries, it’s fair to say that unseating Wichita State and Missouri State at the top was out of the question, but last place? If you told me after the injuries to junior Taylor Brown and senior Sam Maniscalco that Warren would average just under 20 a game and that DSE would emerge as a complete guard, I would have assumed the Braves would have had Thursday off. But instead, they sit underneath it all in dead last place. 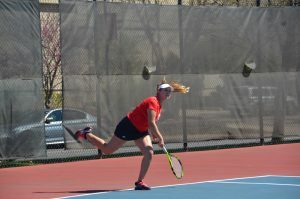 On Saturday night, against their first-round opponent, the Braves showed Peoria what they had been missing all season. First, every home game should be Senior Night. Second, this team was capable of that level of play all year. You don’t finish last in a conference and average over two points a minute in a game. That just shouldn’t happen. As much as I don’t think it’s fair to can Les, last Saturday’s big rout may do more to hurt than help him. 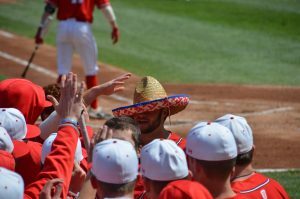 If this team can put up 90 against a middle of the pack team, why the sweep against Illinois State? Why only three other wins in conference? After washing their last game around, I’ve come to the conclusion that maybe it’s time Les goes. Don’t think of this as an about face. Because even at 0-11, I truly didn’t believe he should be fired. But after seeing this team wipe the floor with decent competition, it’s hard to imagine this team couldn’t compete all year in the Valley. So why should Les stay if they could have been right there? I like to believe in second chances. And if Les gets one, that’s fine with me. But when it comes down to it, let’s be honest, he’s got one, probably one and a half feet out the door. After nine seasons at the helm, Les has given the Braves one magical run and several mediocre seasons. The talent he amassed here has been good, but the teams never could stay healthy. And while it might not be fair to him, he can’t just slide by on that excuse forever. Consider this the weakest vote of no confidence one could give. In fact it’s more of a bandwagon jump than anything else. But I think Saturday night shows everyone it’s well deserved. Editor’s note: The Bradley-Drake opening round game was completed before presstime and results could not be factored into this column. Bill Hopkins is a junior sports communication major from Oswego. He is the Scout sports editor. Direct questions, comments and other responses to whopkins@mail.bradley.edu.